For many fans, the highlight of the week, other than the game itself is being able to watch the AFC and NFC team practices. Held each morning, Wednesday through Friday, each team goes through a light warm-up, drills and runs a few plays. These practices are like anything you’d see during training camp or the regular season. At the NFC practice today, wide receivers Mike Evans (Tampa Bay), Davante Adams (Green Bay), Amari Cooper (Dallas), and Adam Thielen (Minnesota) used a competitive game of hot potato as one of their warm-ups. Quarterbacks Russell Wilson (Seattle) and Mitchell Trubisky (Chicago) took turns running plays. At one point, NFL Hall of Fame running back Emmitt Smith decided he missed the game enough to join in. Wilson took the snap as Smith ran up the middle, then turned to grab a quick pass from Wilson. Fans cheered and the media loved it. For more pictures from today’s practice, head over to the Our Turf Football Instagram page or visit us on Twitter. Tomorrow I head over to the AFC practice, and then it is the big Play Football Opening Night where 700 flag football players will have a chance to mix and mingle before their big competition kicks off. They will also get to interact with NFL players and coaches, current and legends. Stay tuned to Our Turf on twitter to be kept up to date on all the activities throughout the week. Shop for new Pro Bowl gear here! 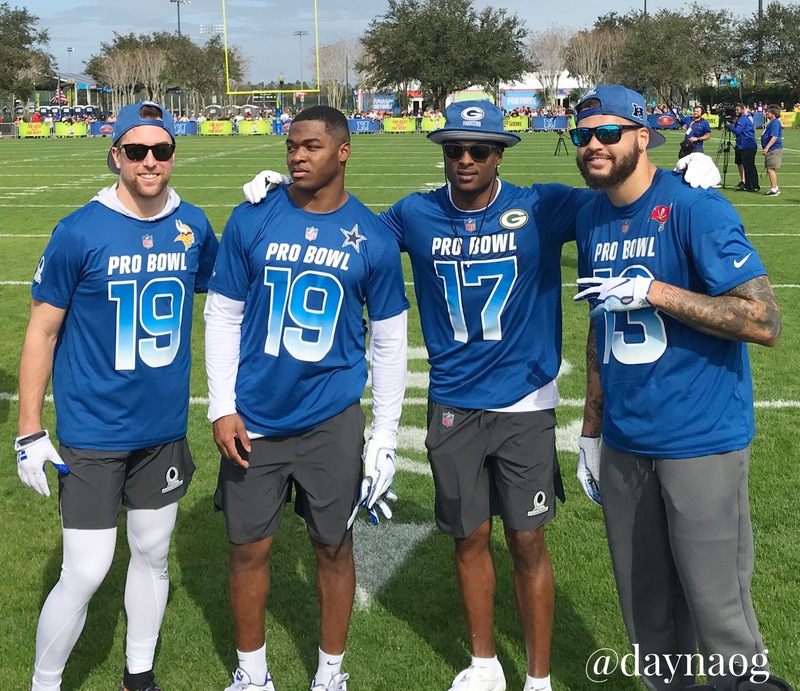 Posted on January 23, 2019 by DaynaOGPosted in NFL NewsTagged Adam Thielen, AFC, Amari Cooper, Davante Adams, Deion Sanders, Emmitt Smith, Mike Evans, NFC, Pro Bowl 2019, Russell Wilson.